My day trip to the Highlands was booked through Timberbush Tours. HYDERABAD : My day trip to the Highlands was booked through Timberbush Tours. Promptly before 8 am I reached the pickup point, walking along the same road as my hotel Scotsman – Edinburgh. It was certainly a delightful walk despite the draught (at seven thirty in the morning, in Scotland, you don’t expect a booming sun warming your way! ): something new and interesting at every turn. The Scottish Highlands attract many a tourist, as the drive is notoriously scenic. Spotting the Loch Ness Monster is another bait – Loch Ness is a large, deep, freshwater loch (lake) in the Scottish Highlands: 24 miles long and over 700 feet deep, it is most famous for its sightings of the Loch Ness monster, affectionately known as “Nessie”. The loch extends for approximately 37 kilometres southwest of Inverness – the largest city and the cultural capital of the Scottish Highlands. Its Old Town features 19th-century Inverness Cathedral, the Old High Church and an indoor Victorian Market selling food, clothing and crafts. Thought I would look at all these while passing through the city, though my main pull was, of course, to see Nessie in flesh and blood. The well-informed and talkative driver Chris kept us entertained for the entire length of the trip, which is 12 hours thirty minutes! He kept track of the ‘80kms per hour strong winds’ throughout, with a faint hope that the storm would abate so that we could take the cruise in Loch Ness. But it wasn’t to be. The storm raged with a vengeance. He consoled us saying that we should enjoy the liquid sunshine (rain) instead! The Greek lady next to me radiated her sunny smiles periodically, telling me where she bought her warm clothes, and how naughty her grandchildren are etc. only bits of which I could follow. I liked her cheerful countenance and warmth. We drove through the most dramatic scenery of the Scottish Highlands watching the gushing water from streams and waterfalls. The hilly Highlands are very sparsely populated. Historic information with jokes sprinkled generously was streaming from the driver’s seat. Before the 19th century the Highlands had a much larger population, but from 1841 and for the next 160 years, many people emigrated mostly to Canada, the USA, Australia, and the industrial cities of Scotland and England. Before 19th century the Highlanders were very poor, traditional, spoke Gaelic and were not much affected by the uplift of the Scottish Enlightenment or the Industrial Revolution that was sweeping the Lowlands of Scotland. But the period of the Napoleonic wars brought prosperity, optimism, and economic growth to the Highlands. 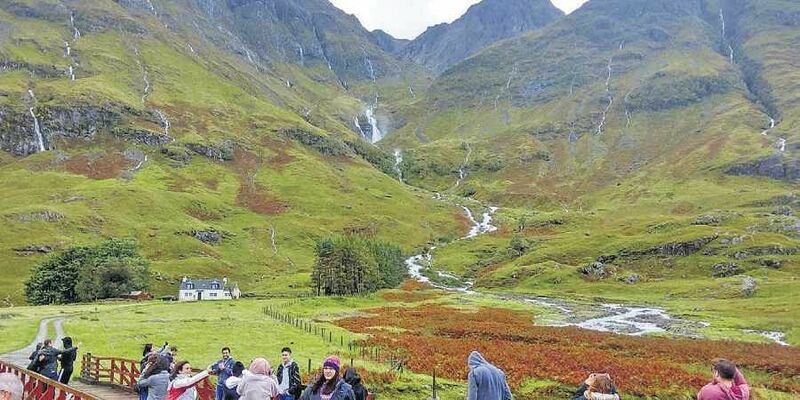 The revival of Highland culture was greatly boosted when Queen Victoria discovered the road north and recognised first-hand, the magnificence of Scotland for herself. We travelled northwest, passing the imposing Stirling Castle, stopped at Kilmahog for some light refreshments and saw some Highland cattle up close. We travelled on through Rob Roy Country of Clans MacGregor and Campbell then over the dramatic landscape of Rannoch Moor and the Black Mount to Glencoe, one of Scotland’s most famous glens, site of the 1692 massacre of the Clan MacDonald. Here we paused for a photo stop, shivering in the cold wind, soaked up the atmosphere in the haunting glen as brown cows grazed and red deer roamed in the Glencoe valley. Plump white sheep dotted the green grass even as the unwanted liquid sunshine drizzled over. Chris said it is a solace: now the streams will flow. As they had a glorious summer that turned everything into brown, no small birds sang but now they’ll all come back! Continuing our tour we stopped in the Fort William area for lunch. Travelling on, we admired the Caledonian Canal and the pretty village of Fort Augustus, enjoying spectacular views of Loch Ness, as we drove along the shoreline to Urquhart Castle. Since we missed the cruise (due to the stormy weather), some of us visited the Castle instead. On normal days you can spend approximately two hours at Loch Ness, where you can choose to take ‘Loch Ness by Jacobite’ cruise and explore the ruins of Urquhart Castle. Passing through Inverness I could see the pretty Greig Street Bridge, the spires of the cathedral and church in the distance. 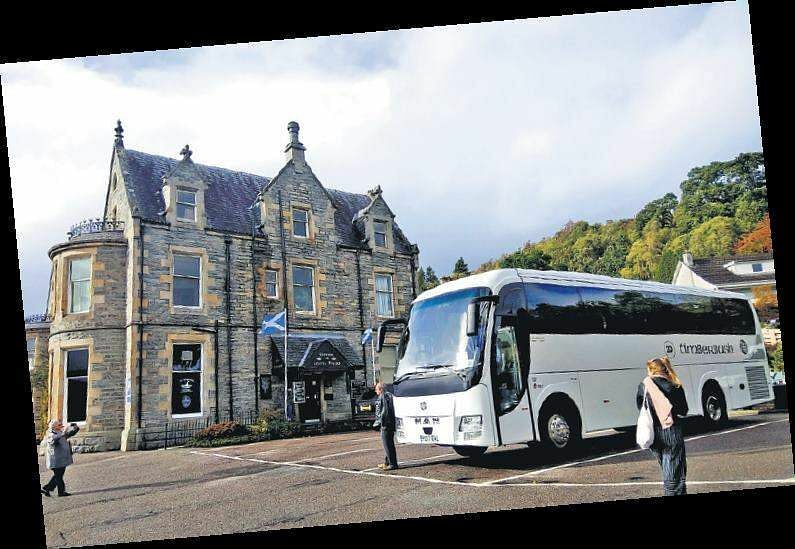 We started our return for home, crossing the Grampian Mountains and the woodland scenery of Perthshire, including the Forest of Atholl, with an evening refreshment stop at the Victorian resort town of Pitlochry. I explored the pretty town briefly (which Queen Victoria visited frequently), entered a restaurant “Prince of India” with a warm heart, only to discover through the cold and unfriendly staff that it belonged to a Bangladeshi who just wanted to cash on the name. We passed through Callander, a charming little town in the historic county of Perthshire, situated on the River Teith, now a popular tourist stop to and from the Highlands. Frequented by Queen Victoria, it was considered fashionable and many Victorians used to follow suit; in its town square, all the royal notices were read loudly. Chris said the town looks prettier during the “Scotland in Bloom” competition with all the flowers hanging. Pointing to the Dun castle across the river, Chris said Andy Murray hailed from the nearby Dunblane Village. We also went past a riding school for children with special needs set up by a friend of Chris, where Princess Anne visits often (she is a great equestrian, as we all know). Chris said the princess is very casual and friendly. As we were nearing Edinburgh, Chris showed us Alexander Graham Bell’s house and pointed towards JK Rowling’s house: a huge mansion where she lives with her husband and kids. Her children go to a private school – a fabulous building that came up a little later. The staggering annual fees he mentioned made me swoon. We took a turn at Sean Connery’s house and came back to the starting point. Twelve hours spent in the highlands (though missed Nessie), were worth every minute!